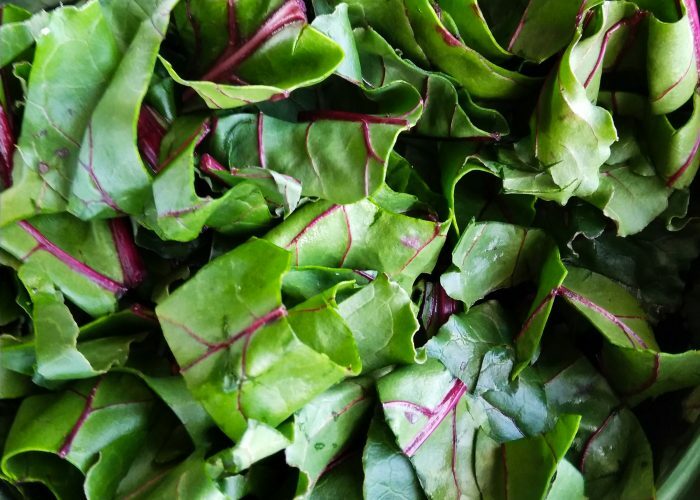 I love the color of fresh beet leaves. They are a vibrant green that contrasts beautifully with the reddish stalks. Some time ago, I found myself with some beets leaves and stems, so decided to try cooking them. After all, if beets are so good for you (to learn about the nutritional value of beets, read here), it would be a waste to throw away the leaves! (It should be noted that this logic is not true for all leaves. A good example would be rhubarb leaves which have a very high oxalic acid content and should not be eaten.) So after some experimentation, I’ve come up with the following sautéed beet leaves dish. It uses a bit of garlic and sesame oil for a fragrant and tasty side dish. Try it for yourself and with your family! My husband, who used to balk at eating beets, has come around and now enjoys beets when they make an appearance at our dinner table. At the grocery store when I see a fresh bunch of beets, I usually snap them up. It is such a good deal! The bunch of beets, usually consisting of three beets with the leaves attached, only costs a few dollars but would make at least 2-3 side dish meals in our household over the course of the next two weeks. Also, if I keep the leaves and stalks attached to the beets, I find they keep each other lasting longer in the refrigerator in a fresher state. This dish uses the leaves and stalks from about 3 beets, and it can be gluten-free if you use salt or tamari sauce instead of soy sauce in the recipe. A simple yet tasty way to prepare this vegan, egg-free, dairy-free, nut-free and possibly gluten-free vegetable side dish, using beet leaves to yield a fragrant, slightly sweet and salty dish. Fry the chopped garlic in some olive oil in a saucepan over medium heat for 2-3 minutes until lightly browned. Add in the chopped stems and stir-fry them for 2-3 minutes. Then add in 1-2 tablespoons of water, stir and cover the pot to help the stems soften as they cook. Turn the heat burner down to low-medium heat and let the stems cook for about 5-6 minutes. Taste test the stems occasionally to check if they are cooked through. Then turn the heat burner back up to a medium heat setting, and add in the tablespoon of sesame oil. Mix the stems with the garlic and sesame oil together, then add the chopped beet leaves on top. Stir to mix in the beet leaves with the sesame oil, then cover the pot and let cook for 2-3 minutes. Top with sesame seeds and serve! Wait unto right before you cook to chop up the beet leaves. This is because the beet leaves seem to act like spinach and spoil quickly when damaged or cut. During cooking, the stems tend to soak up a lot of water so keep checking and adding more water to cook the stems down as needed. The stems also take much longer to cook compared to the leaves, so it is beneficial to chop the stems more finely to reduce the cooking time.